Robyn is an Australian teenager who did some volunteer work at the sanctuary a few months ago. 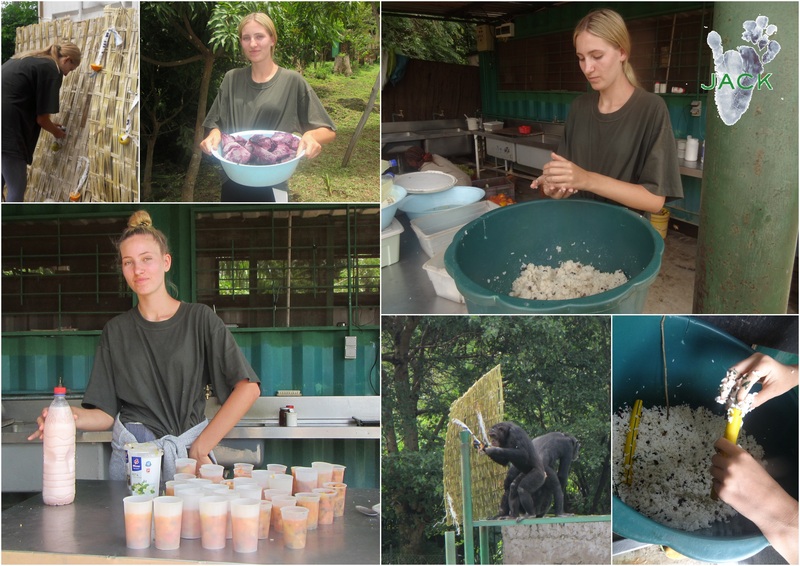 Passionate about wildlife and primates, she flew back home with many great souvenirs in her mind and with the determination of doing her best to support her new furry friends! This is how, despite all the work she had at school, Robyn managed to organise a fundraiser in Perth, the city where she lives! 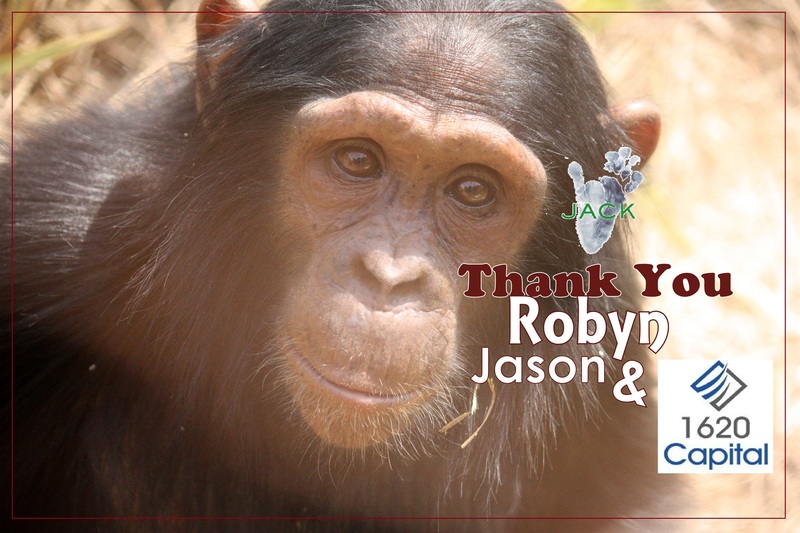 Thanks to her father, Jason, who is working for 1620 CAPITAL in the DRCongo, Robyn managed to insert J.A.C.K. Sanctuary in the flyer of a famous football event that took place in Perth on March 25th. 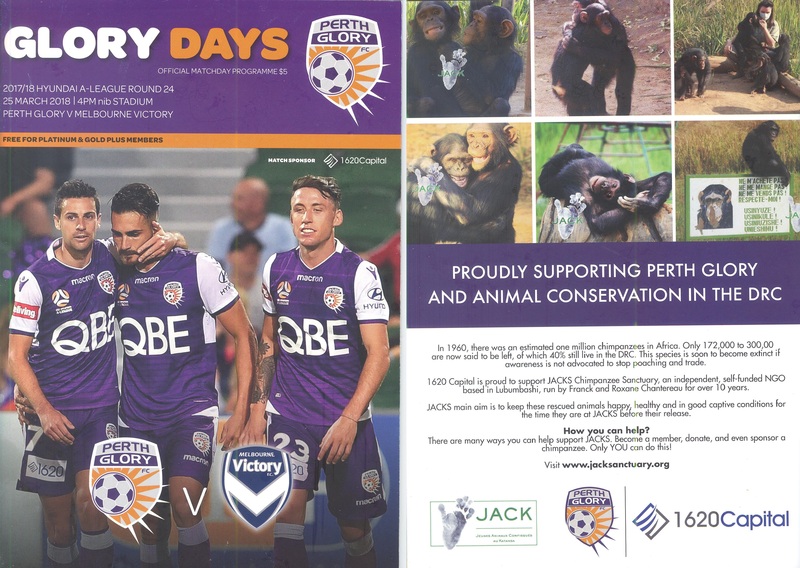 Yes, our Congolese Sanctuary indeed shared a whole page in the GLORY DAYS OFFICIAL MATCHDAY PROGRAMME with the Perth football team, PERTH GLORY, as both are being supported by 1620 CAPITAL! 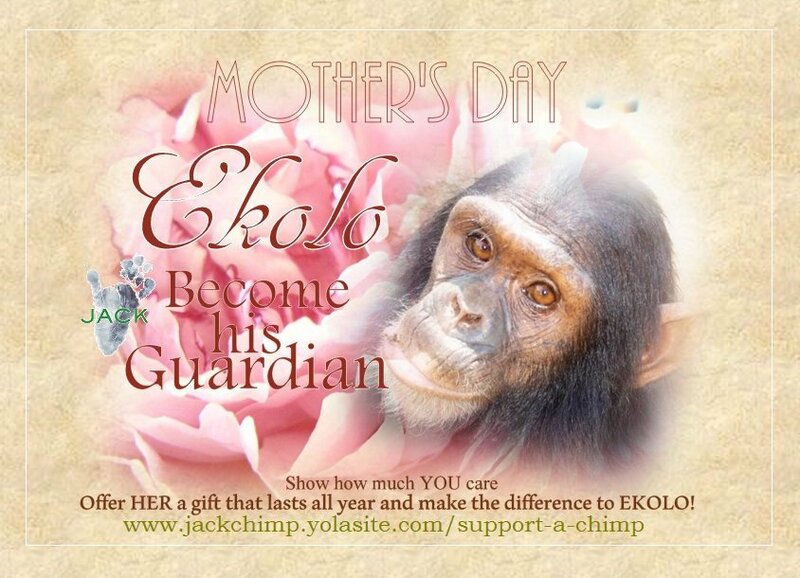 A wonderful idea which enabled Robyn to spread awareness on great apes and J.A.C.K. during an important event and which helped her fundraise 500USD for her chimpanzee friends! Dear Robyn, thank YOU so much for all that you do for LUNA and the other residents of J.A.C.K. Your Love and Help are greatly appreciated and represent a lot tho THEM! Also, many, many thanks to Jason and to 1620 CAPITAL for their wonderful support and interest in our action! Your aid helps J.A.C.K. provide its rescued oprhans with he best care! Thank YOU all for THEM! 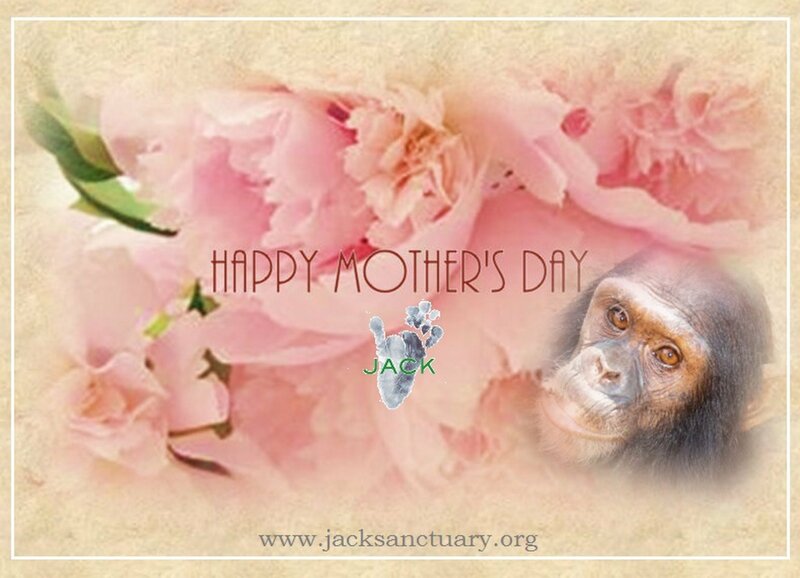 To all the Mothers who are having their “Special Day” today: have a great day and enjoy it! Today, on the first of May, it is Labor Day. While most of the people are off, we at J.A.C.K. are working to keep our hairy residents happy and healthy! Therefore, I would like to thank our precious team for its dedication and hard work as without these great people, Franck & I would’t be able to give these orphans the best care! THANK YOU ALL FOR HELPING US GIVE THEM THE BEST CARE!! 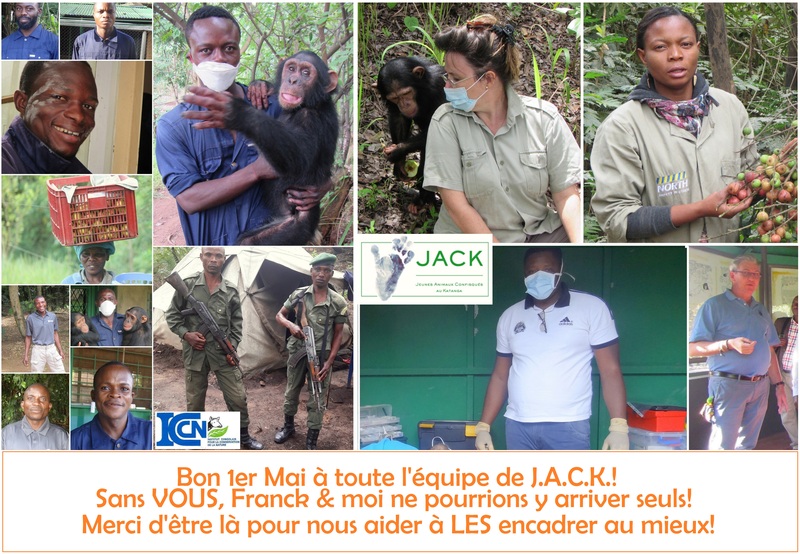 Throughout year 2017, and thanks to a good friend of J.A.C.K., Patrick Pools, our sanctuary took part in a competition named “We love your project”. 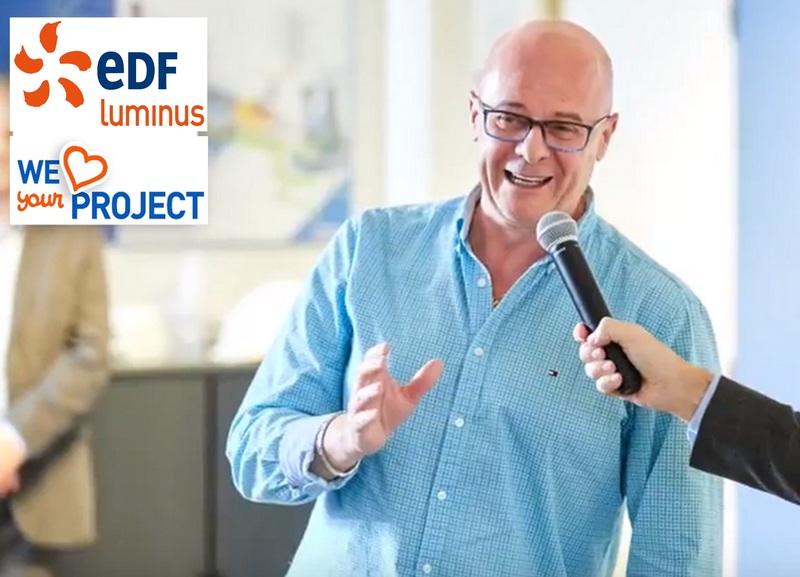 This event is organised every year by EDF Luminus, an energy producer in Belgium, which offers the chance to its employees to put forward the charity they work in as volunteers. Since Patrick grew up in the DRC and had helped J.A.C.K. in finding funds, he wanted to introduce J.A.C.K. to his colleagues and friends through this annual ‘We love your Project” event. The competition started early 2017 and ended in November 2017. 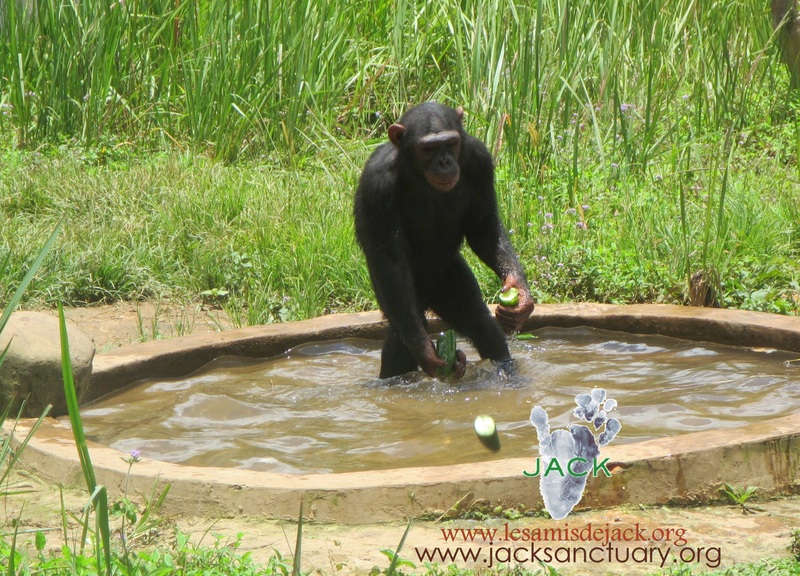 Patrick was J.A.C.K.’s representative and did his utmost to make our chimpanzees win the second price of the competition! 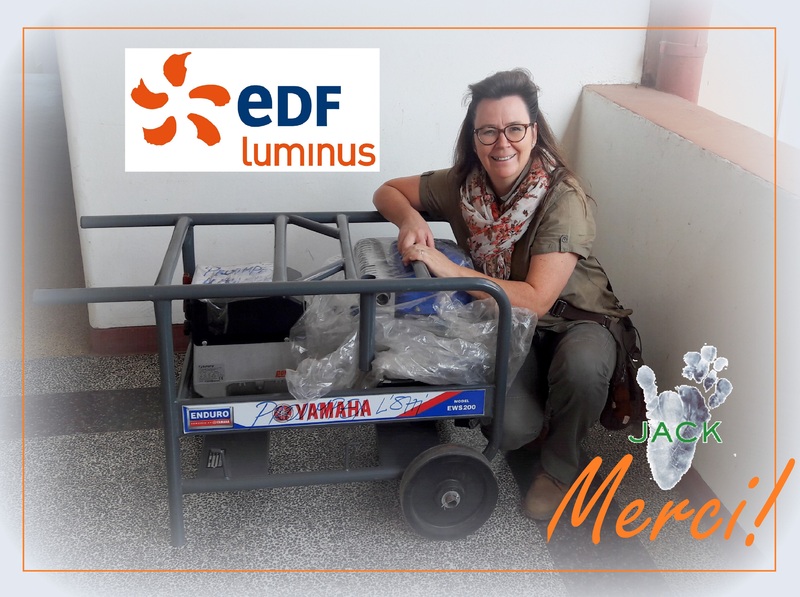 Yes, thanks to Patrick’s determination and the kindness of his colleagues who voted for him, our sanctuary won 3000 Euros to buy a generator for its brand new Veterinary Clinic! A wonderful present, isn’t it??? 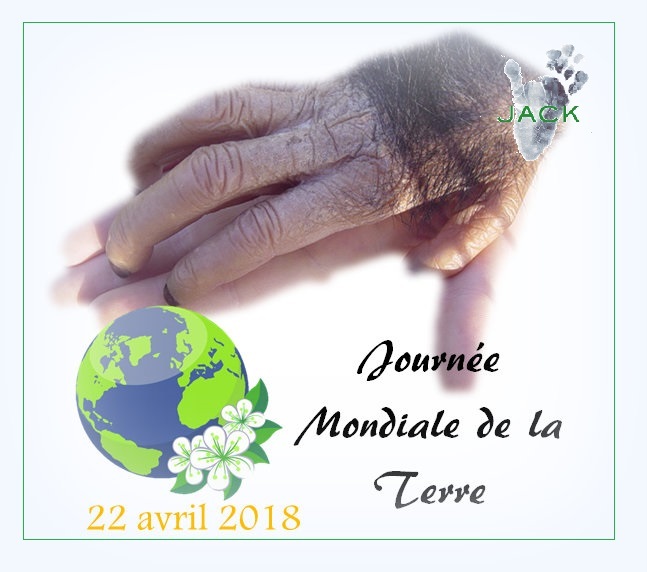 Dear Friends of EDF Luminus and dear Patrick, we at J.A.C.K. thank YOU all for this wonderful present!! Know that it will help us a lot!!! let’s all work tohether to keep it healthy and strong! At J.A.C.K. 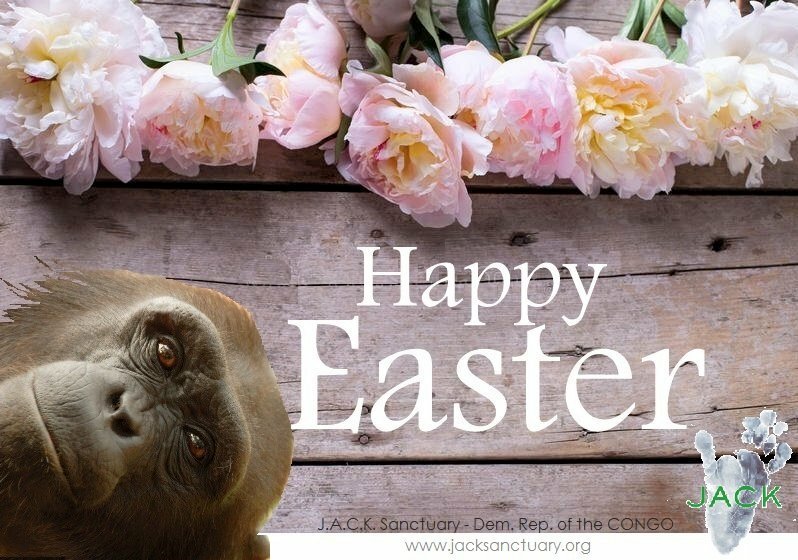 this morning, the chimps didn’t hunt for Easter eggs but only for…. cucumbers!!! At least, these are healthier and don’t contain palm oil!!! You wish to help J.A.C.K. in its action in the DRCONGO but you don’t know how to proceed? 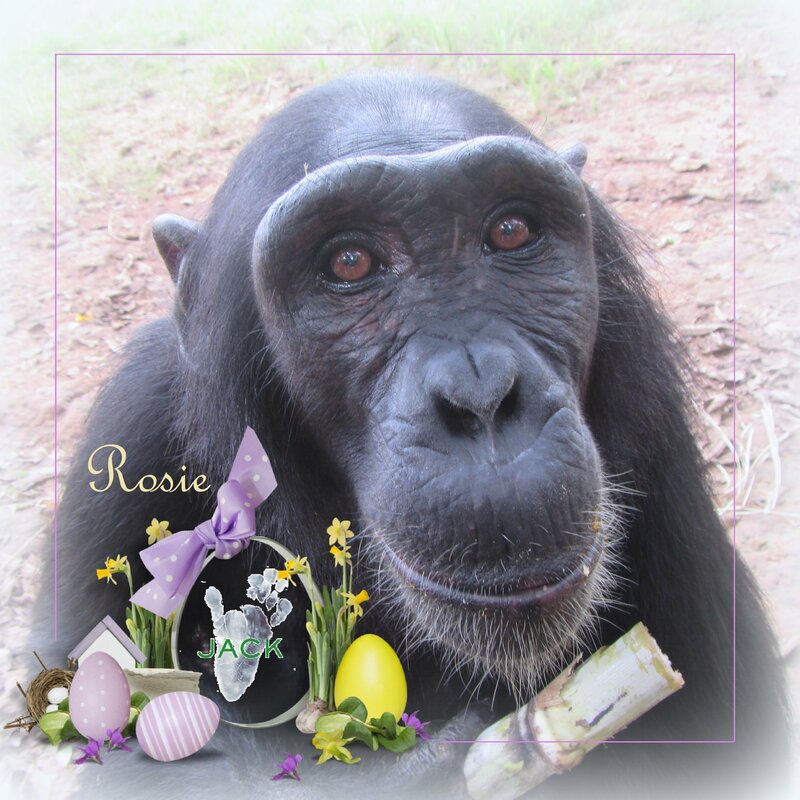 Please, join our orphaned chimpanzees on their EASTER page and have a look at the different ways to support THEM! Any contribution is more than welcome and has all its sense for the residents of J.A.C.K.